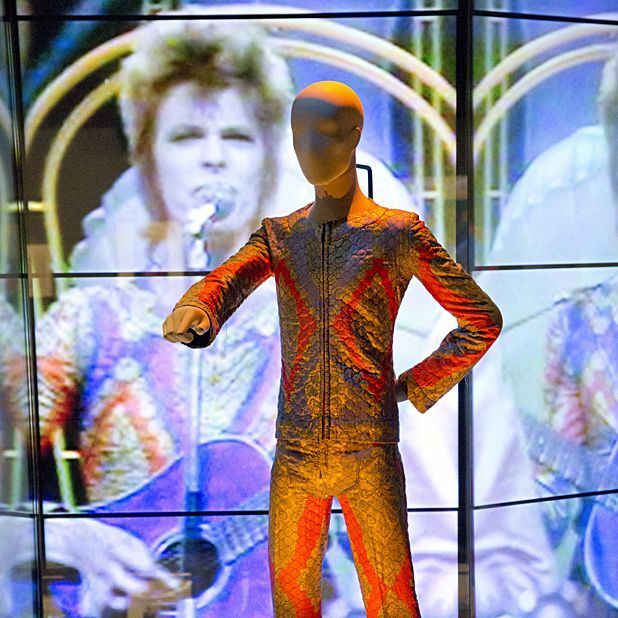 If you were one of the unlucky thousands who couldn’t get tickets for last year’s sublime David Bowie exhibition at London’s Victoria and Albert Museum, this curio gives you a little taste of what you missed. In truth, it’s a bizarre idea – a docu-tour, presented by Victoria Broackes and Geoffrey Marsh, curators of theatre and performance at the V&A, who steer us round their exhibition, a remarkable trawl through the Bowie archive. Admittedly fans of the multi-faceted musician may be wary of the pretentious nature of such an exercise. Particularly when Broackes, who is even wearing Bowie earrings in his honour, starts us off by showing a specially commissioned rice sculpture; representing everyone who was born in Britain in 1947, including Bowie, it’s not exactly a promising opening gambit (and, yes, it's cut to 'Absolute Beginners'). Still, it’s worth hanging in there. Partly filmed on the final night of the exhibition’s five-month stint in London, cameras are present to see Broackes and Marsh address a live audience and bring on special guests to talk about what Bowie means to them. Those who take the mic include Pulp’s Jarvis Cocker (who claims Bowie has handwriting like a '14-year-old girl') and film historian Sir Christopher Frayling, who provides an elegant dissection of Bowie the actor. Outside of this there are interviews (for example with Terry O’Neill, who shot the famous pic of Bowie and a rearing mutt during the 'Diamond Dogs' era), alongside footage of the man himself in an attempt to capture his many sides. Of course, this can’t be done in a 99-minute ramble. Indeed, directors Hamish Hamilton and Katy Mullan even struggle to capture the scale of the exhibition, an admittedly difficult task. But this peek into the elaborate world of a unique cultural icon hits enough high notes. Selected release from Mon 17 Nov.